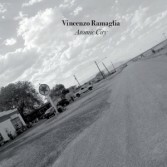 "Atomic City" is the fourth album by Vincenzo Ramaglia, landing of a long research path that begins more than ten years earlier and is marked by the three recording projects before this unexpected electronic turn. In 2007, the critics defines his first CD, "Formaldeide" (score for flute, clarinet, sax and piano), as a "place of impossible meeting between Coleman Hawkins and Salvatore Sciarrino" (Michele Coralli, Blow Up), and also as an interesting attempt - "erudite and at the same time approachable, [...] antithetic to some piano pop, pimp and intimist, with contemporary pretensions" (Vittore Baroni, Rumore) - to reach an ideal "‘medietas’, right compromise between agreeableness and research" (Daniele Follero, Sentireascoltare). Regarding the second CD, "Chimera" (2008, score for double-bass and loop station with improvisations of sax and drums), the critics talk about "bravery and obstinacy", and "an admirable interface at the zenith of the starry sky of intelligent and improvised jazz and new contemporary music" (Max Marchini, Rockerilla), about "aesthetics of the contrast" (Michele Coralli, Blow Up), about a "changeable dissonance between free and reiterated figures" (Vittore Baroni, Rumore), about a "union of very different kinds of music elements: the composed/interpreted and the improvised, the predetermined and the unexpected" (Zeno Gabaglio, Azione), about an "antidote" able to avoid "every banality, every possible easy way, with a singular purity of intent" and about "a disc ‘not for the faint of the heart’, but readable with the innocence of a child, or the competence of a wise man. Often the same thing" (Max Marchini, Ondarock). "PVC smoking" (2011), his third CD, is an "IDM score" with improvisations, combining electronics, acoustic instruments (cello, bass clarinet and sax), fretless electric bass. In the opinion of the critics, "always moving with courage along the perilous boundaries between improvised and contemporary art music, light years from irritating diatonicisms and empty new ages, the young Roman composer distills a new masterpiece" (Max Marchini, Rockerilla), through "a schizophrenia that can probably become also a new synergy of listening" (Michele Coralli, Blow Up). After seven years of reflection, silence, construction and deepening of an electronic setup without a computer, "Atomic City" is a surprise, an album finally naked, devoid of any score, but with an intricate maze of analogue sequences, composed on the machines as on a pentagram, almost in a thoughtful orchestral counterpoint, and manipulated in real time by the author, to which Renato Ciunfrini - already sax of "Chimera" and "PVC smoking" - this time reacts with clarinetist improvisations. In a sense, "Atomic City" is the promised land of all the peregrinations and breaks that precede it. The synthesis - unexpectedly coherent and explosive in his unprecedented language - of a vast collection of seemingly contradictory urgencies. And it is, in fact, PEM. Popular Experimental Music.